The most effective theories for business, education, and management are centered on the concept of engagement. In business, Theory Y leadership has been proven more effective at engaging employees than Theory X leadership in most situations. In education and coaching the following Teddy Roosevelt quote is often cited, “Nobody cares how much you know, until they know how much you care.” Engage the student! Engage the athlete! He suggests that coaches should encourage kids to make mistakes. How many of your kid’s coaches do that? Do they yell at them instead when they make a mistake? He talks about the illusion of knowledge, false confidence, and false fundamentals. What are these concepts and why are these concepts important? He suggests that coaches need to learn to be quiet, watch, and listen. Do you believe the coaches in youth sports programs should be always talking to the athletes to help them improve? He says that coaches should not punish their athletes as a way of trying to improve their performance. How many push-ups have your kids had to do because something went wrong in practice? Read on! The following links are just a sample of posts about how to engage the athlete at a higher level. Kessel’s blog presents the concept of engagement as it relates to the sport of volleyball. These concepts apply to tennis and other sports. Read the above posts (and others) and give it some thought. If necessary, go back and read them again in a couple of days or weeks. Without a doubt, you will develop a different perspective about coaching. 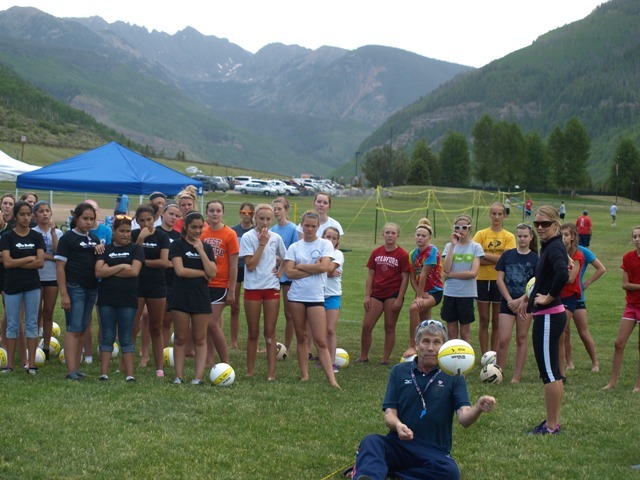 John Kessel engages the athletes at a grass volleyball clinic in Vail. The quality of American men’s tennis has gradually deteriorated since Pete Sampras unofficially retired in 2002. It dropped off further when Andre Agassi played his last match in 2006. The final nail in the coffin was delivered when Andy Roddick stepped away from the sport in 2012. For the past 13 years there has been very little to cheer about on the men’s side, especially at the Grand Slam tournaments. Recently, John Isner has been the top performer. With his big serve he has frequently been ranked between 15th and 25th. That means he has usually been seeded in that same range. Over time, he has been a dependable performer. In many tournaments he has usually held his seed and had the best record of any of the American men. At this year’s Wimbledon Isner was seeded 18th. Even though he had a 2-1 record and was defeated in the round of 32 he did not have the top performance of the American men. Sam Querrey provided a pleasant surprise for the American men with a 4-1 record! As the 28th seed he defeated Lucas Rosol (Czechoslovakia) in the first round and Thomaz Beluci (Brazil) in the second round. Then he stunned Novak Djokovac (Serbia) in 4 sets in his third round match. Querrey continued his winning ways in the round of 16 by defeating Nicolas Mahut (France) before bowing out to Milos Raonic (Canada) in the quarterfinals. The 11 American men posted a respectable 14-11 record at Wimbledon this year. The five first round losers included Denis Kudla, Bjorn Fratangelo, Brian Baker, Taylor Fritz, and Rajeev Ram. Five Americans won their second round matches. Donald Young was the only player to exit with a 1-1 record. Jack Sock, Dennis Novikov, and John Isner were 2-1 and lost in the round of 32. Like Querrey, Steve Johnson had a strong performance, finishing 3-1 and departing in the round of 16. Most likely the surprising performance of Querry and Johnson is an anomaly. One can only hope that Querrey, Johnson, and Isner will continue their winning ways at the U.S. Open next month. Stay tuned! Serena Williams topped off an exceptionally strong performance by the American women at Wimbledon with her 22nd Grand Slam singles trophy. In addition, Serena and Venus captured their 6th women’s doubles title. Overall the 18 American women were 25-17 in singles, although the Williams sisters accounted for almost half of those victories. Venus was 5-1 and lost in the semis, while Serena was 7-0. Coco Vandeweghe and Madison Keys both had respectable 3-1 showings as they reached the round of 16. Vandeweghe was seeded 27th and Keys was 9th. The nine American women to lose in the first round were: Anna Tatishvili, Alison Riske, Nicole Gibbs, Louisa Chirico, Madison Brengle, Victoria Duval, Irina Falconi, Shelby Rogers, and Bethanie Mattek-Sands. Christina McHale, Varvara Lepchenko, and Samantha Crawford were each 1-1. They bowed out in the round of 64. Julia Boserup and Sloane Stephens fared slightly better. They were 2-1 and lost in the round of 32. The performance is in line with the WTA rankings. On June 20th there were 3 American women in the top 10, 5 in the top 30, and 14 in the top 100. It is impressive to be able to say that about 1-in-7 players among the top 100 are American women. It is also interesting to note that half of the women are younger than 25 and half are older. Of the players who are 25 years or younger, only Stephens, Keys, and possibly Vandeweghe have the potential to win Grand Slam events after the Williams sisters retire. Of the older players, only Serena Williams is capable of winning a Grand Slam singles title. Next stop, U.S. Open – with the exception of the few players who will participate in the Olympics. Look for another strong performance by the American women at Flushing Meadows. Is Serena Williams on the Decline? Some think that Serena Williams is on the decline. To justify that viewpoint they would argue that she has lost in the finals of the last three Grand Slams to players she should have beaten. Not only that, in 2016 she has won only 1 tournament, she has lost in the finals of 3 tournaments (including 2 grand slams) and she was defeated in the round of 16 in the other tournament. Even though she is #1 in the world, she is “only” 24-4. By comparison, #2 ranked Agniewszka Radwanska is 25-7 in 8 tournaments this year. She has won 1 tournament, made it to the semis of 4 tournaments, lost in the round of 16 twice and was defeated in the round of 64 on 1 occasion. • She has “only” won 55.6% of the points played this year. • She has “only” won 62.6% of the games played this year. • Given the low percentage of points she has won, she is lucky to win 87.1% of her matches. • She has won 53.7% of the points played this year. • She has won 59.4% of the games played this year. • She is not far behind Williams and has won 78.7% of her matches. The following tables from the WTA website (wtatennis.com) show YTD serving and receiving data (through the French Open) for both women. The difference between #1 and #2 is a reflection of contrasting styles of play. The data shows that Williams is more of a power player and holds an advantage in the percentage of first serve points won and in the percentage of break points saved. As a steadier player, Radwanska holds an advantage in the percentage of return games won. The difference in the percentage of total points won seems minor (55.6%-53.7%=1.9%); however, it translates to a much larger difference in the percentage of matches won (87.1%-78.7%=8.4%) Clearly, Serena Williams is the most dominant player on the women’s tour. USTA General Manager of Player Development Martin Blackman has been on the job for about a year and the results of the French Open show that not much has changed in the win column for the American men. The women and girls have had solid performances in the Grand Slams and the men and boys have not. When hired a year ago, Blackman made a realistic plea for fans to be patient. It particular he told fans not to set their expectations too high for the young American boys because they were young, they didn’t need additional pressure, and the transition from junior play to the pro tour was tougher than most people realize. Bjorn Fratangelo lost in the second round and ended the tournament 1-1. Jack Sock bowed out in the third round and finished the tourney 2-1. John Isner lost in the 4th round and held his seed. The performance of the American men at the 2016 French Open showed they are some of the top players in the world, but they are no match for the world’s elite players. Time will tell if the younger players such as Taylor Fritz can hang with the best in the world. Overall the men were 6-10. Ulises Blanch finished the tournament 1-1 with a loss in the second round. Both Nathan Ponwith and Gianni Ross posted 2-1 record, but they bowed out in the third round. Overall, the American boys were 5-9. The American men and boys have often struggled on the clay at the French Open. Hopefully the grass courts at Wimbledon will be more to their suiting. The 2016 French Open was the third Grand Slam in a row where Serena Williams was upset in the finals by an unlikely competitor. This time her loss came at the hands of the rising Spanish star, Garbine Muguruza. Even with the loss, Williams remains almost untouchable. So far this season she is 24-4 in 5 tournaments, bringing her career singles win-loss record to 761-127. This year Williams has won 1 tournament, lost in the finals of 3 tournaments and bowed out in the round of 16 in the other tournament. Impressive! Serena Williams was one of 18 American women playing at the 2016 French Open. Sloane Stephens held her #19 seed and exited in the third round with a 2-1 record. Venus Williams, #9 seed, and Madison Keys, #15 seed, had solid tournaments finishing with 3 wins and 1 loss each. They bowed out in the round of 16. Shelby Rogers had the best tournament of her career. She finished 4-1, while losing in the quarterfinals to Muguruza. Overall the American women had a strong tournament with a combined total of 22 wins and 18 losses. There is also good news with the American junior girls. Amazingly, they all won their first round matches. Kenin held her #10 seed by reaching the third round. Amanda Anisimova held her number two seed and lost 7-5, 7-5 in the finals to the number 12 seed, Rebeka Masarova of Switzerland. Overall, the Americans girls posted a cumulative 18-10 record. Wimbledon is right around the corner and hopefully there will be more good news for the American women and girls. The May 25th season-ending Intercollegiate Tennis Association (ITA) women’s team rankings (http://www.itatennis.com/) saw Stanford and California at the top of the polls. Both schools are from the PAC-12. The SEC conference had three top ten teams – Florida, Vanderbilt, and Georgia. The ACC also had two teams in the top 10, North Carolina and Miami. Six of the top 10 teams moved up in the rankings compared to the January 5th rankings, two remained in the same position, and two teams fell in the rankings but remained in the top 10. By the end of the season, USC, Virginia, UCLA, and Texas A&M had fallen out of the top 10 rankings (January 5th). As expected there was minimal movement in the singles rankings between January 5th and June 1st, with a couple of exceptions. • In the January 5th poll, Joana Eidukonyte, Clemson, was ranked first; she finished the season in the 30th position. • Belinda Woolcock of Florida was ranked 3rd on January 5th, but fell to 15th by the end of the season. • Julia Elbaba, Virginia, was ranked 8th at the start of the season and dropped to 13th. • Finally Klara Fabikova, California, began the season ranked 10th and finished in the 16th position. The ACC dominated the top 10 singles rankings with 5 players. Miami had two players ranked in the top 10. The results of this year’s team and individual tournaments were interesting in the sense that the number one team in the country Stanford only had one singles player ranked in the top 25. Carol Zhao was ranked 24th. Having strong depth is much different than having the top players in the country. Some teams have depth, some have strong players, and a few have both. That is what makes college tennis so exciting. The release of the May 23rd ATP rankings foretells another dismal summer for the American men in the Grand Slams. The 3 American men with the greatest chance of success are John Isner, Jack Sock, and Taylor Fritz. Isner has been consistently ranked 15th to 20th. He is frequently seeded in the top 16 and uses his big serve to hold his seed. His best showing in a Grand Slam event came in 2011 when he reached the quarterfinals of the U.S. Open. Jack Sock has been inconsistent in his short career. Sock’s best showing in a Grand Slam tourney came in 2015 when he reached the 4th round of the French Open. The other long shot is newcomer Taylor Fritz. He is at the head of a group of youngsters who are expected to reach the elite ranks in the next 3 to 5 years. The top 10 includes players from 9 countries. Only Switzerland is represented by two players, Federer and Wawrinka. The average age of the top 10 is 29.2 years. Generally, players above the age of 30 are on the downhill side of their careers. There are 8 Americans ranked in the top 100. They are excellent players who will occasionally have some great wins, but their lack of points demonstrates they are not capable of consistently competing with the top 10 players. The average age of the American players ranked in the top 100 is 25.9 years. Isner and Ram are over 30. Finally there are 9 Americans ranked between 101st and 200th. The younger players in the above group are learning how difficult it is to make the transition from junior tennis to the pro tour. The older players are wondering if it is time to hang up the racquet. It will be interesting to see how many of these players make it into the top 100 by the end of the summer. Courtney Thompson, setter for the USA Women’s National Volleyball Team has written a blog post on the Positive Performance website talking about how she uses mental training to push through and overcome fatigue instead of getting frustrated and feeling bad for herself. This post summarizes her discussion to help athletes deal with fatigue so it doesn’t take them out of their game. #1: It’s not about you, so get over it. Put the team ahead of your ‘feelings’ and get it done! #2: All champions experience fatigue when pushing their limits. So feel it and embrace it… fatigue means you’re on your way! No one said success would be easy. #3: Your mind is incredibly powerful. Use it to help you! You’re an athlete. Being tired is a part of that, so accept it and move on. Choose to think about what you need to do to help the team in that moment. #4: Your mission doesn’t care if you’re tired. Find what works for you and use it. I want to go to bed at night knowing I did everything I could possibly do to help my team reach our mission. #5: We won’t always feel 100% in a game. Train yourself to be ready for those days. The real competition in sports and in life is competing with yourself to bring your personal best, day in and day outfit is unrealistic to think we will perform feeling 100% all the time. #6: Check that your behaviors are in line with your objectives. People often look at an athlete who wins a championship and think that getting there must have all been fun, happy, and maybe even comfortable, The pursuit of becoming your best is hard work. #7: Mood follows action. Start little, and keep going. From the start of a rough day, act in line with your goals—make just one small step—and you’ll gather momentum and come to realize you’re actually in control of your mood and your day. Then take one more small step, then another, and another. At some point your ‘mood’ will change as you involve yourself in each step, each task. #8: Remember: the pain of not going all out is much bigger than the pain of holding back. What I’ve learned is that at some point the high of winning and the sting of losing will wear off, and the real joy comes from knowing you exhausted every possibility to help your team reach its goals and whether or not you and your team were good teammates along the way. The January 5th ITA rankings provided a rough guide about which D1 women’s teams would be ranked at midseason. When comparing the January 5th and April 5th ITA rankings it can be seen that only 3 of the top 10 teams in January improved their rankings while 7 teams had lower rankings. In fact 5 of the original top ten teams had fallen out of the top 10. The most notable was USC which was no longer ranked. The newcomers to the April 5th top 10 were Ohio State, Miami, Duke, Pepperdine, and South Carolina. A similar drop off can be seen when comparing the January 5th and April 5th top 10 singles rankings. Two players dropped out of the top 10. Only 3 of the athletes improved their rankings, 6 had lower rankings, and 1 athlete had the same ranking as in January. The newcomers to the April 5th top 10 ITA rankings were Luisa Stefani, Pepperdine; Ellen Perez, Georgia; and Brooke Austin, Florida. Stay tuned, we’ll see what the top 10 looks like at the end of the season.